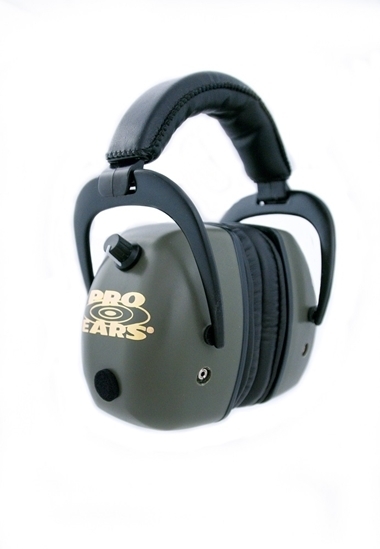 The ProMag GOLD model by Pro Ears is an electronic hearing protection designed for high noise situations or shooting in an enclosed area such as indoor ranges, very high caliber loads, demolitions, etc. The ProMag has a very high NRR (noise reduction rating) of 30 dB. Because of the compounding effect of pressure waves (vibrations) generated by gun fire indoors, it is imperative when shooting indoors that the user wear a model with a higher NRR level than standard hearing protection models provide. The Full-cup design makes this muff a great choice for the handgun shooter. The Pro Ears ProMag GOLD units are used by Range Masters / Instructors; anyone exposed to an extraordinary amount of shooting; anyone who has moderate or high hearing loss, etc. This electronic hearing protection made by ProEars is the first to feature a high-tech, 8 bit Micro-Processor inside. This feature monitors the entire electronics system 10,000 times a second. When you turn on your Pro Ears the Micro-Processor does a complete diagnostic of the electronics so you always know your system is working This new series also comes equipped with an LED Alert Light on each circuit board that lets you see how your unit is working. Pro Ears also added a computer controlled Auto-Shut Off feature and a Low Battery Indicator. The ProMag Gold is designed with Receiver/Input capabilities for: AM/FM Radio, Cassette Tape, Stereo, CD and other electronic Communication/Entertainment Receiving Devices. Exclusive 8 Bit Micro-Processor performs a complete diagnostic on all electronic components 10,000 times a second.